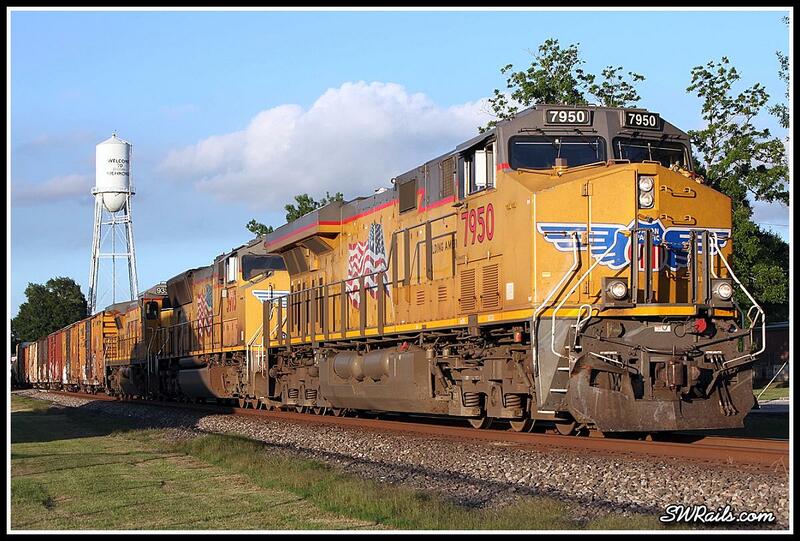 There was a MofW curfew this afternoon to allow BNSF forces to do trackwork on both sides of the Tower 17 UP/BNSF interlocking in Rosenberg. 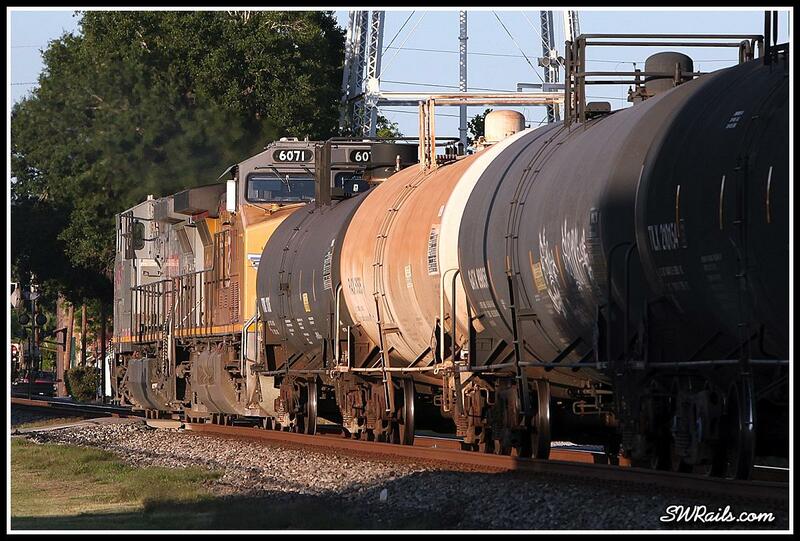 Due to issues completing the work, the BNSF foreman wasn’t able to release his time until 6:40 PM, over an hour later than planned. Listening to the radio during dinner, I knew it was a mess. I heard the dispatcher talking to 3 different westbounds, all stopped in the Sugar Land area. We finished dinner right about the time the BNSF foreman gave back his track and time. I left home around 6:45 to try my luck. 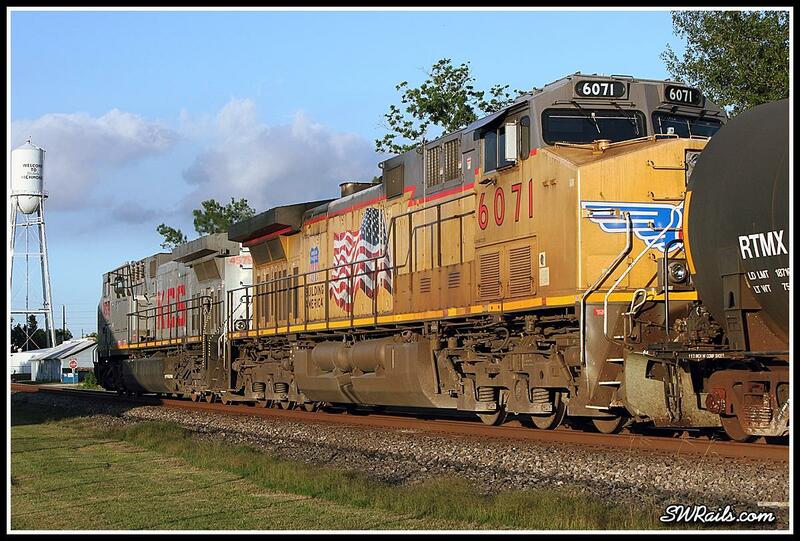 MP 19 – BNSF 7909 – slow-rolling on the main at Missouri City, headed into Sugar Land siding so Amtrak #1 can get by. 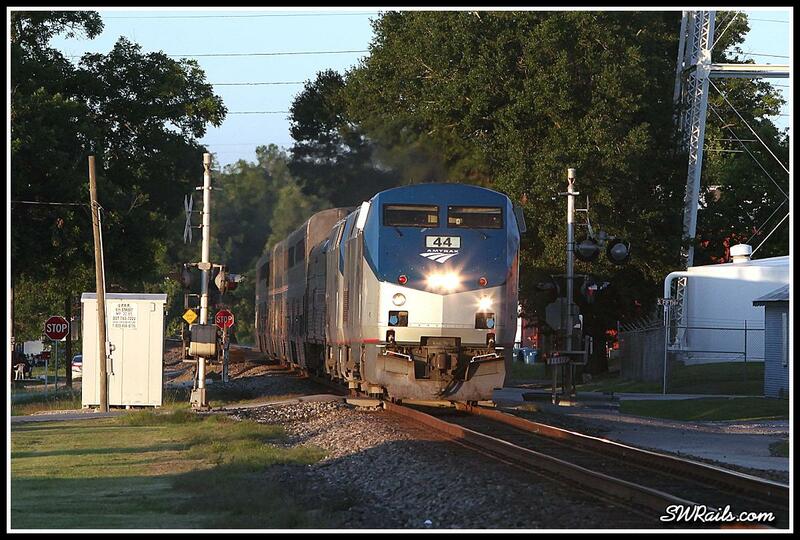 MP 12 – AMTK 44 – Amtrak #1 slow rolling at West Junction, to allow the “cluster” ahead to clear up. Since I didn’t leave home until the track re-opened, I didn’t expect to catch the first 3 westbounds, as the lead one was 8 miles away. My goal was to just get the BNSF and Amtrak around MP 25-27, depending on the light. 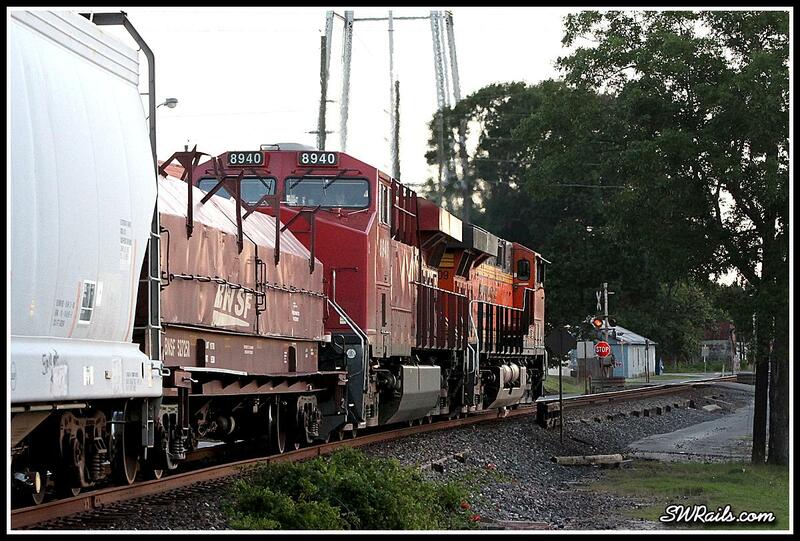 But it turned out that the first train to move across the Tower 17 interlocker was KCS 4778 East. It would go into Harlem siding before the parade could start. Upon hearing this development, I realized I had a shot at “running the table”. I arrived at the west switch of Harlem, CP SA030, just as the rear end of the KCS was clearing up. Within a minute or so, the DS calls UP 9766, telling them “I’m ready for you at the west end of Harlem”. The MEWEG-04, UP 9766 arrives at 7:14 PM. 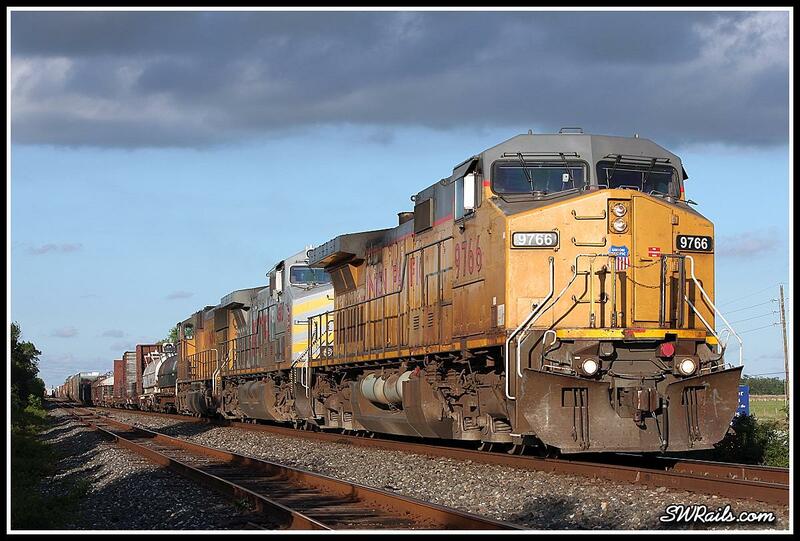 The second unit is KCS 4583, an AC4400CW. 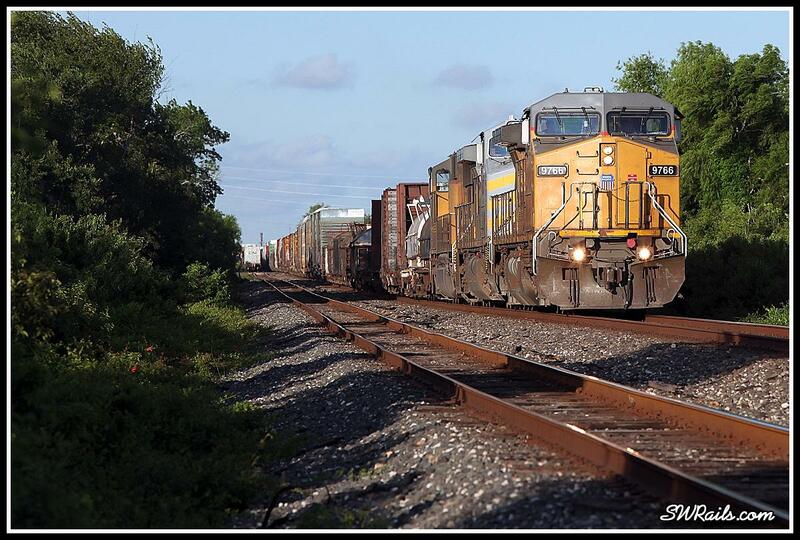 UP 9766 approaches the clear signal indication at CP SA030. What clear signal? It’s there, just hard to spot in the small image. 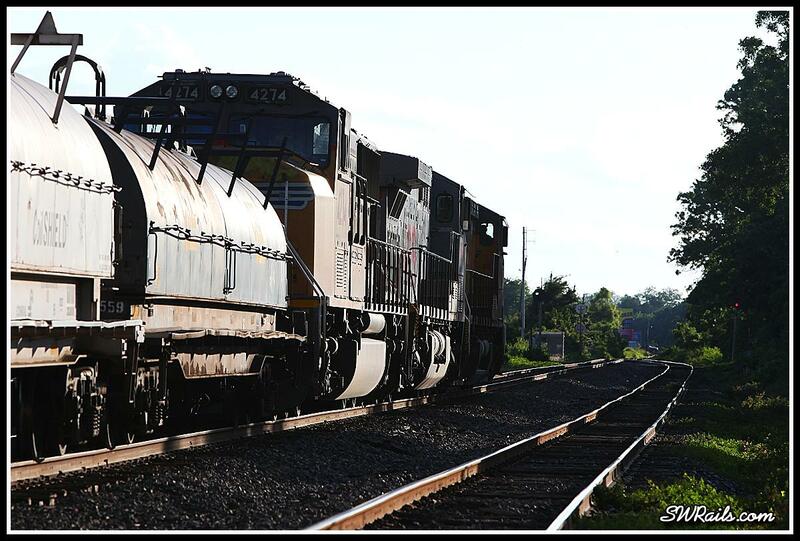 If you click the image, it will be easier to see the signal just ahead of the lead motor. The shadows were getting too long for me to stay at Harlem, so I headed west to Richmond to look for better light. I ended up at the Eight St. grade crossing, MP 32.96. 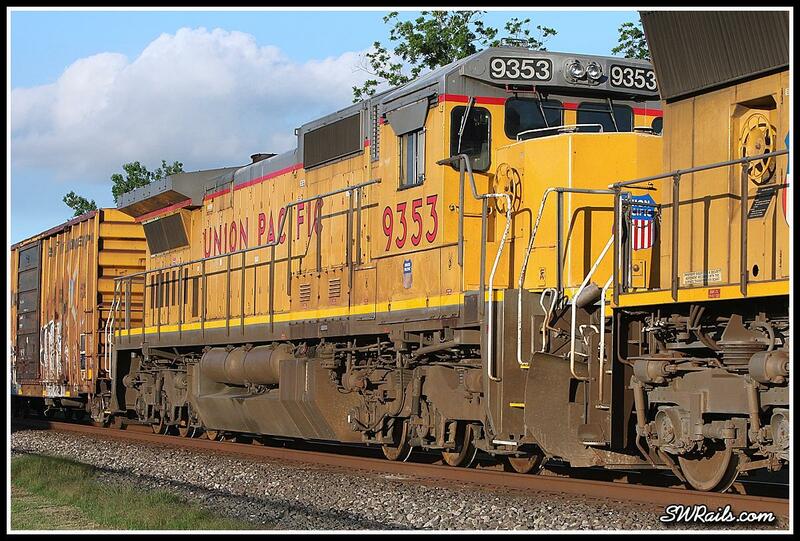 The trailing unit, UP 9353, was a fine sight with its standard cab. The fact that it was DIC didn’t bother me at all. An interesting load on TTDX 964725. The trailers have USMC stencils on them. Any idea what these little tank-trailers are for? As the DPU’s come into view, the trailing unit looks out-of-place. Not bad-two consecutive UP trains with KCS power! 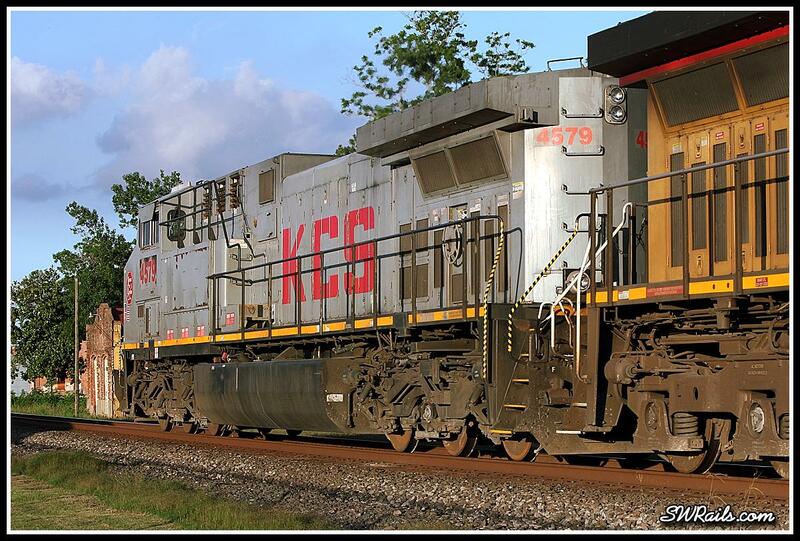 KCS AC4400CW 4579 brings up the rear. The light was still nice here, but I don’t like to shoot back-to-back trains at the same location if it can be avoided. 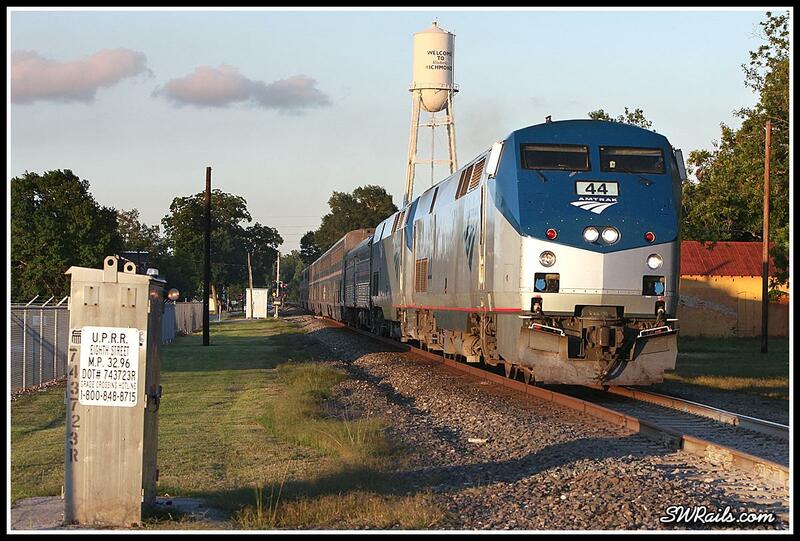 So I headed a few blocks east to the Brazos River bridge to wait for the next train. Upon arrival, I was pleasantly surprised to see that I could get nice light from the north side of the bridge. 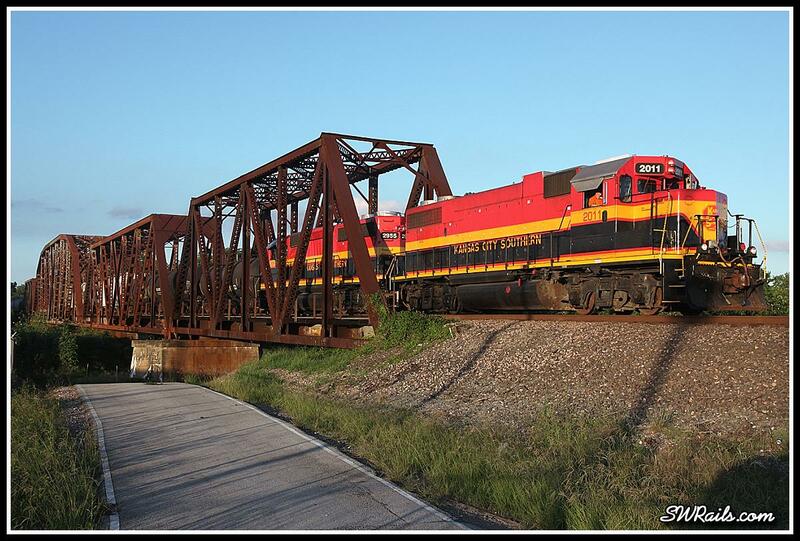 The KCS Rosenberg Local, led by GP38-2 2011, exited the west end of the Brazos River bridge at 7:46 PM. Back to the 8th Street grade crossing to wait for Amtrak #1. 9 minutes after the KCS local, AMTK 44 comes into view at 7:55 PM. Check out just how long the shadows are. The shadow from the rail on the left reaches all the way to the base of the rail on the right. But it was clear enough to where the light was really nice; not hazy as is typical. Back to the Brazos River bridge for the last westbound in the fleet. I thought I might get it in sun, but it was not meant to be. The sun dropped below the tree line about 4 minutes before BNSF 7909 arrived at 8:08 PM. 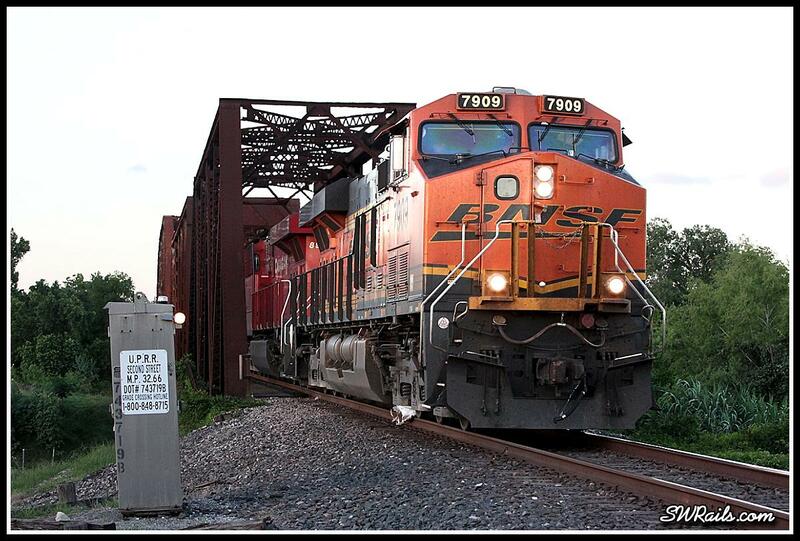 The bright red CP ES44AC trailing unit suggests that BNSF’s power shortage continues. I didn’t quite run the table. I did catch all 5 trains, but I don’t get full credit for the last train on account the shot wasn’t in good light. Nevertheless, 5 westbounds in 54 minutes ain’t too shabby for my neck of the woods. those trailers I believe are used to carry water in the field. 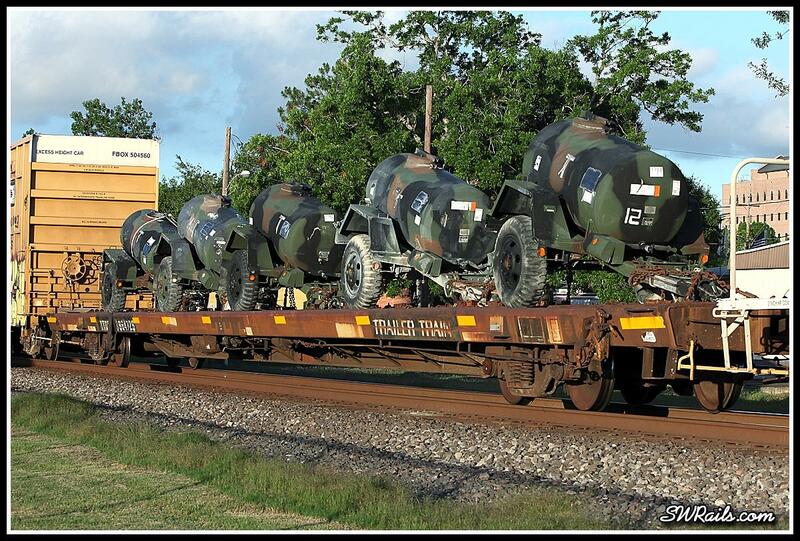 Wondering if those wagons with large tanks might be for bomb disposal or transport..? YOU SURE DID GREAT ! ! ! ! ! ! ! Y’all did GREAT ON YOUR ” RUNN’N ” ! ! ! ! ! ! ! ! ! ! The trailers are aptly named water buffaloes. They are used to carry potable water out to the soldiers (or marines in this case) during training exercises.